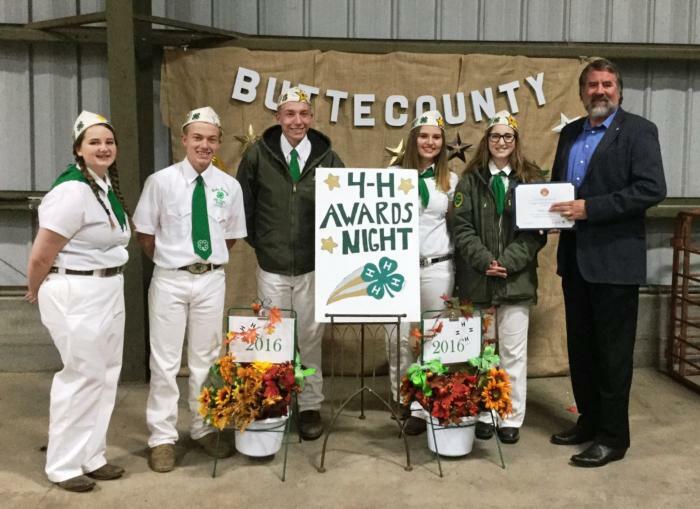 This event is an awards and achievement night for the 4-H members and volunteers of Butte County. This event recognizes youth who have outstanding Record Books, completed proficiencies, and have achieved Emerald Stars and All-Star. Clubs are recognized for their participation in the National 4-H Display Contest and volunteers are recognized for their years of service with the 4-H Program. Presently, this event holds an ice cream social and dessert bar during the social hour, free of charge. All are welcome to attend, but must RSVP. In the past, this event had been the "Awards Barbecue" and had served a tri-tip dinner, handed out awards, and had a live auction of baskets for sale. The funds from this event were used to sponsor the Butte County 4-H College Scholarships. This event is hosted by the Cohasset 4-H Club with assistance from the West Gridley 4-H Club.